The town of Dartmouth, on the south coast of Massachusetts at the west side of the entrance to Buzzards Bay, grew as a center for shipbuilding and whaling in the early nineteenth century. A lighthouse was needed to help guide local shipping traffic, and Dumpling Rock, a few hundred yards offshore from Round Hill Point, was an ideal location. On May 23, 1828, a sum of $4,000 was appropriated for the lighthouse. The initial structure on Dumpling Rock consisted of a two-story, stone dwelling with a lantern on its roof. It was first lighted on October 19, 1828, and Levi Smith was the first keeper at a yearly salary of $400. The lantern held a system of 10 ten10 lamps and 14-inch reflectors, exhibiting a fixed white light 43 feet above the sea, visible for 10 nautical miles. Left: The first Dumpling Rock Light with its original lantern (U.S. Coast Guard photo). In the early 19th century a kind of semaphore system was employed by the keeper at Dumpling Rock Light. When a ship was approaching New Bedford Harbor, the keeper would raise a signal arm on a post. The merchants of New Bedford, seeing the signal, would prepare to sell their goods to the incoming mariners. I visited this light in the afternoon , and found the keeper absent on the main, without having paid the least attention to the lights since he extinguished them in the morning. The reflectors appeared not to have been burnished for some time, and the lantern covered with smoke. In fairness to the keeper, life at isolated Dumpling Rock was difficult. The condition of the reflectors was probably not the keeper's fault. Smith reported in 1842 that the silver was all worn off the reflectors. He also complained that the water cistern often was filled with salt water instead of fresh water. The sea often encroached on the light station until the government finally built a wall around Dumpling Rock. Engineer I.W.P. Lewis inspected Dumpling Rock Light in 1842. He reported that the walls of the dwelling were cracked and and the windows were leaky. He also said that the lantern had been "shaken nearly to pieces in storms." A new lantern and deck were installed in 1851. In 1888, the Lighthouse Board announced that the dwelling was in such bad condition that it would have been a "waste of money to give it further repair." Instead, a new wood-frame dwelling, 26 by 34 feet, was built on the old foundation in 1890. A square wooden tower was attached to the house, with a lantern containing a fourth-order lens. A new protective bulkhead, 90 feet long and made of hard pine timber, was bolted to the rock and reinforced by stones salvaged from the old dwelling. A black lantern on a white frame tower which rises 48 feet above high water mark, attached to NE corner of a white frame dwelling -- it is lit by a fixed white light visible for a distance of 12 nautical miles. The bell tower is about 100 feet south of light. The fog signal bell is struck by machinery alternating a single and double blow with intervals of 30 seconds. It was often foggy in the vicinity, and it was decided that a more powerful fog signal was needed. A Daboll trumpet, operated by a steam engine, was put into service on October 12, 1897. Octave Ponsart, later at Butler Flats, Cuttyhunk and West Chop, was keeper at Dumpling Rock in September 1938 when the worst hurricane in New England history hit. Ponsart and his family were just about to leave on their first vacation in several years, leaving the assistant keeper in charge. Their suitcases had already been placed in a dory when the wind suddenly picked up and the seas rose. Ponsart and his assistant, Henry Fontineau, tried to secure the lighthouse tower, but the situation soon looked hopeless. The first floor of the house filled with water. Ponsart and his wife, daughter and niece, along with Fontineau and his wife, all went to an upstairs bedroom, leaving the station's dog, Rexeena, swimming on the first floor. Chunks of roof flew off and all the windows were quickly broken. Suddenly there was a thunderous crash and a violent shaking of the house. Ponsart and Fontineau looked downstairs to find water almost to the ceiling. A huge piece of Dumpling Rock itself had been torn away and crashed through the living room wall. The boulder stayed in place partly inside the house, anchoring the dwelling to the rock. This lucky accident may have saved the lives of the keepers and their families as the house remained anchored throughout the storm. Emma Ponsart later said that the hymn, "Rock of Ages, Cleft for Me," held new meaning for her after that day. Rexeena survived by climbing to the top shelf of a linen closet. The Ponsarts and Fontineaus lost all their belongings and had to make repairs to the station themselves. The remains of the lighthouse were removed in 1942 and a skeleton tower was erected in its place, exhibiting a flashing green light. The automatic light at Dumpling Rock remains an active aid to navigation. 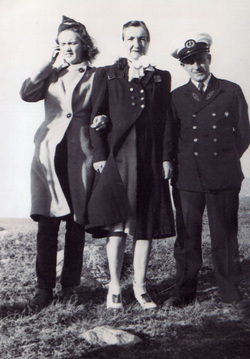 Right: Keeper Octave Ponsart with his wife, Emma (center), and their daughter Bette. Courtesy of Seamond Ponsart Roberts. Levi Smith (1828-1856); C. C. Smith (1856-1873); Thomas Allen (assistant 1867-1870); George Sistare (assistant 1870-1873, keeper 1873-1883); Frank W. Thomas (1883-1884); Charles H. Hinckley (1884-1892); William H. Doane (1892-1896); Maynard F. Rush (1896-1908); George V. C. Bacon (1st assistant, 1900); Ernest R. Sylvester (1st assistant 1900-1903); Percy S. Williams (1st assistant 1903-? ); Samuel F. Dunton (1st assistant, then keeper 1904-1908); Vivian A. Currier (1st assistant 1904); Jonathan Loving (?) (1st assistant 1904-1905); Edward E. Brewer (assistant, then keeper 1911-? ); E. H. Snell (1908-1911); Howard A. Haggett (?) (1st assistant 1909); George Brightman (1st assistant 1909); F. W. Field (1st assistant 1909); John Lopes (assistant 1909); William E. Wheeler (assistant c. 1909); Frank W. Craig (c. early 1900s); Pierre Albert Nadeau (assistant, c. 1919-192? ); Frederick A. C. Bohm (assistant, 1926-1927); John A. Strout (assistant, c. late 1920s); John E. Rogers (1927-1933); Albert W. Bartow (? ); George T. Gustavus (c. 1933-1936); Alvin Hacking (c. 1930s); J. J. Collins (1936); Octave Ponsart (1937-1942); Henry Fontineau, assistant (c. 1936-1940).